Fig. 1. 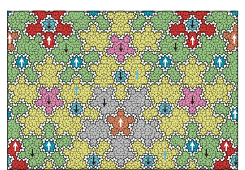 Disguised antiferromagnetic order in the Penrose lattice. In each cluster, only one-sublattice sites have nonvanishing magnetic moments at U = +0, and they polarize in the same direction marked by arrow, whereas the moment size is zero everywhere in the other sublattice. To study an antiferromagnetic order in the Penrose lattice, we have employed the half-filled Hubbard model with sites on the vertices of rhombus units. When the Coulomb repulsion is switched off (U = 0), this model has a thermodynamically degenerate single-electron states called confined states; each of them is strictly confined in a finite region of the lattice . Since their energy locates at the center of spectrum E = 0, they contribute to the formation of magnetic moments, upon switching on U. Magnetic moments have nonvanishing amplitudes at most of sites, even in the limit of U→+0; the site average of moment size is 81/2–25 τ ~ 0.05. We know that they should exhibit an antiferromagnetic long-range order at zero temperature, because the Penrose lattice is bipartite despite the lack of translation symmetry. A big surprise is that this antiferromagnetic order is disguised and the moments exhibit a very complicated fractal-like spatial pattern. The magnetic order is cluster antiferro; moments are polarized in the same direction in each cluster, and neighboring clusters polarize in the opposite directions . The clusters have sizes ranging from 31 sites to infinity, and their densities follow a power-law scaling with their size. This is an intricate consequence of quasiperiodic lattice structure. With increasing U, the magnetizations of minority spin continuously evolve, and the magnetic order approaches a conventional Néel type with staggered magnetization. This crossover depends on local environment of each site, and it is also dominated by the quasiperiodic structure. This study is performed by collaboration with Akihito Koga at Tokyo Institute of Technology. M. Arai, T. Tokihiro, T. Fujiwara, and M. Kohmoto, Phys. Rev. B 38, 1621 (1988). A. Koga and H. Tsunetsugu, Phys. Rev. B 96, 214402 (2017).